Stephanie Ritter is all of us. The LA-based personal assistant became so frustrated with her job prospects after graduation, she has decided to sell her diploma and “college experience” on eBay. 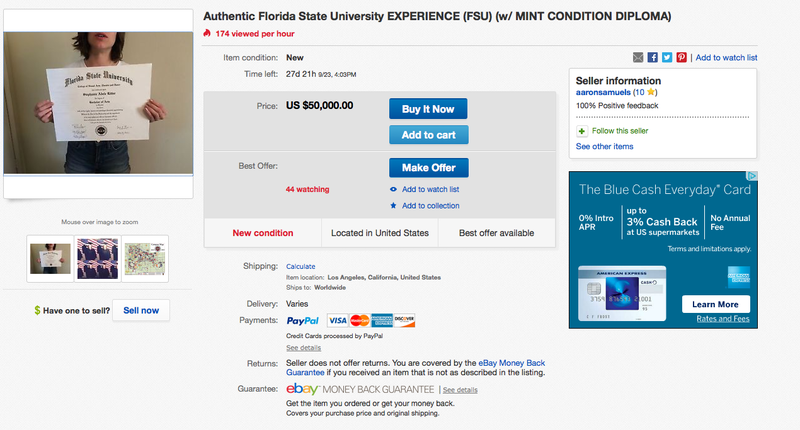 The underemployed college graduate’s belongings can be yours for $50,000. Ritter was cleaning her room when she came across her Florida State University diploma. She graduated college in 2011, but has had trouble finding major-related work after graduation. And she’s not alone: a recent study showed that only 27% of college graduates manage to find jobs that are related to their major. Despite everything, Ritter said that she would choose to go to college again. The second time around though, she would change a couple of things, like studying in a city where she could make more money in order to support herself, and finding a more LGBT-friendly school.